On Tuesday, 30 Jumada Al-Awwal, 1440 A.H., in her office, Her Excellency the University Vice President for Female Student Affairs received the Vice Dean of the College of Applied Sciences, Dr. Raja' bint Tahir Ma`tuq, and the Deputy Head of the Department of Chemistry, Dr. Tahani bint Muhammad Bawazir. At the meeting, Her Excellency received the annual report of the Department of Chemistry for the academic year 1438/1439 A.H. Her Excellency viewed the report, which documented the achievements of the department and its academic and research activities. 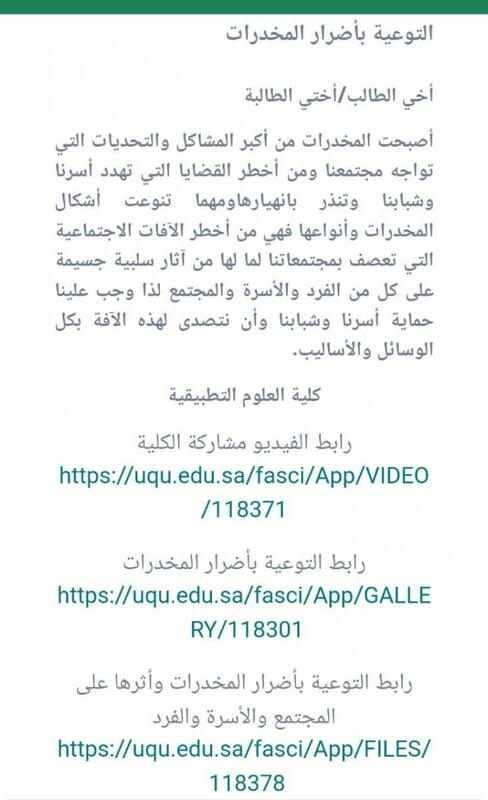 It also outlined the educational activities and scientific lectures, the department's role in serving the university and the community, the department's vision, mission and objectives, details of summer training, and also decisions and recommendations of the department for the academic year 1438/1439 A.H. Her Excellency the Vice Dean of the College, Dr. Raja' Ma`tuq, in her name and on behalf of all the college female staff and the Department of Chemistry, expressed her thanks and appreciation to Her Excellency Dr. Sarah bint Omar Al-Khuli, the University Vice President for Female Students Affairs, for her constant and continuous support to the college, which stems from her keenness to improve its outputs and to fulfill its mission towards excellence and active community partnership. On her part, the Deputy Head of the Department of Chemistry, Dr. Tahani Bawazir, offered her thanks and appreciation to the University Vice President for Female Student Affairs, and to the Vice Dean of the College, Dr. Raja' Al-Khuli, for their constant support of the department's activities and programs.